This Nineteenth Chapter describes how Lord Vamanadeva asked for three paces of land in charity, how Bali Maharaja agreed to His proposal, and how Sukracarya forbade Bali Maharaja to fulfill Lord Vamanadeva’s request. When Bali Maharaja, thinking Vamanadeva to be the son of a brahmana, told Him to ask for anything He liked, Lord Vamanadeva praised Hiranyakasipu and Hiranyaksha for their heroic activities, and after thus praising the family in which Bali Maharaja had been born, He begged the King for three paces of land. Bali Maharaja agreed to give this land in charity, since this was very insignificant, but Sukracarya, who could understand that Vamanadeva was Vishnu, the friend of the demigods, forbade Bali Maharaja to give this land. Sukracarya advised Bali Maharaja to withdraw his promise. He explained that in subduing others, in joking, in responding to danger, in acting for the welfare of others, and so on, one could refuse to fulfill one’s promise, and there would be no fault. By this philosophy, Sukracarya tried to dissuade Bali Maharaja from giving land to Lord Vamanadeva. The summary of this Twentieth Chapter is as follows. Despite his knowledge that Lord Vamanadeva was cheating him, Bali Maharaja gave everything to the Lord in charity, and thus the Lord extended His body and assumed a gigantic form as Lord Vishnu. After hearing the instructive advice of Sukracarya, Bali Maharaja became contemplative. Because it is the duty of a householder to maintain the principles of religion, economic development and sense gratification, Bali Maharaja thought it improper to withdraw his promise to the brahmacari. To lie or fail to honor a promise given to a brahmacari is never proper, for lying is the most sinful activity. Everyone should be afraid of the sinful reactions to lying, for mother earth cannot even bear the weight of a sinful liar. The spreading of a kingdom or empire is temporary; if there is no benefit for the general public, such expansion has no value. Previously, all the great kings and emperors expanded their kingdoms with a regard for the welfare of the people in general. Indeed, while engaged in such activities for the benefit of the general public, eminent men sometimes even sacrificed their lives. It is said that one who is glorious in his activities is always living and never dies. Therefore, fame should be the aim of life, and even if one becomes poverty-stricken for the sake of a good reputation, that is not a loss. Bali Maharaja thought that even if this brahmacari, Vamanadeva, were Lord Vishnu, if the Lord accepted his charity and then again arrested him, Bali Maharaja would not envy Him. Considering all these points, Bali Maharaja finally gave in charity everything he possessed. Lord Vamanadeva then immediately extended Himself into a universal body. By the mercy of Lord Vamanadeva, Bali Maharaja could see that the Lord is all-pervading and that everything rests in His body. Bali Maharaja could see Lord Vamanadeva as the supreme Vishnu, wearing a helmet, yellow garments, the mark of Srivatsa, the Kaustubha jewel, a flower garland, and ornaments decorating His entire body. The Lord gradually covered the entire surface of the world, and by extending His body He covered the entire sky. With His hands He covered all directions, and with His second footstep He covered the entire upper planetary system. Therefore there was no vacant place where He could take His third footstep. This chapter describes how Lord Vishnu, desiring to advertise the glories of Bali Maharaja, arrested him for not fulfilling his promise in regard to the Lord’s third step. With the second step the Supreme Personality of Godhead reached the topmost planet of the universe, Brahmaloka, which He diminished in beauty by the effulgence of His toenails. Thus Lord Brahma, accompanied by great sages like Marici and the predominating deities of all the higher planets, offered humble prayers and worship to the Lord. They washed the Lord’s feet and worshiped Him with all paraphernalia. Riksharaja, Jambavan, played his bugle to vibrate the glories of the Lord. When Bali Maharaja was deprived of all his possessions, the demons were very angry. Although Bali Maharaja warned them not to do so, they took up weapons against Lord Vishnu. All of them were defeated, however, by Lord Vishnu’s eternal associates, and, in accordance with Bali Maharaja’s order, they all entered the lower planets of the universe. Understanding Lord Vishnu’s purpose, Garuda, the carrier of Lord Vishnu, immediately arrested Bali Maharaja with the ropes of Varuna. When Bali Maharaja was thus reduced to a helpless position, Lord Vishnu asked him for the third step of land. Because Lord Vishnu appreciated Bali Maharaja’s determination and integrity, when Bali Maharaja was unable to fulfill his promise, Lord Vishnu ascertained that the place for him would be the planet Sutala, which is better than the planets of heaven. The summary of this Twenty-second Chapter is as follows. The Supreme Personality of Godhead was pleased by the behavior of Bali Maharaja. Thus the Lord placed him on the planet Sutala, and there, after bestowing benedictions upon him, the Lord agreed to become his doorman. Bali Maharaja was extremely truthful. Being unable to keep his promise, he was very much afraid, for he knew that one who has deviated from truthfulness is insignificant in the eyes of society. An exalted person can suffer the consequences of hellish life, but he is very much afraid of being defamed for deviation from the truth. Bali Maharaja agreed with great pleasure to accept the punishment awarded him by the Supreme Personality of Godhead. In Bali Maharaja’s dynasty there were many asuras who because of their enmity toward Vishnu had achieved a destination more exalted than that of many mystic yogis. Bali Maharaja specifically remembered the determination of Prahlada Maharaja in devotional service. Considering all these points, he decided to give his head in charity as the place for Vishnu’s third step. Bali Maharaja also considered how great personalities give up their family relationships and material possessions to satisfy the Supreme Personality of Godhead. Indeed, they sometimes even sacrifice their lives for the satisfaction of the Lord, just to become His personal servants. Accordingly, by following in the footsteps of previous acaryas and devotees, Bali Maharaja perceived himself successful. While Bali Maharaja, having been arrested by the ropes of Varuna, was offering prayers to the Lord, his grandfather Prahlada Maharaja appeared there and described how the Supreme Personality of Godhead had delivered Bali Maharaja by taking his possessions in a tricky way. While Prahlada Maharaja was present, Lord Brahma and Bali’s wife, Vindhyavali, described the supremacy of the Supreme Lord. Since Bali Maharaja had given everything to the Lord, they prayed for his release. The Lord then described how a nondevotee’s possession of wealth is a danger whereas a devotee’s opulence is a benediction from the Lord. Then, being pleased with Bali Maharaja, the Supreme Lord offered His disc to protect Bali Maharaja and promised to remain with him. This chapter describes how Bali Maharaja, along with his grandfather Prahlada Maharaja, entered the planet Sutala and how the Supreme Personality of Godhead allowed Indra to reenter the heavenly planet. The great soul Bali Maharaja experienced that the highest gain in life is to attain devotional service under the shelter of the Lord’s lotus feet in full surrender. Being fixed in this conclusion, his heart full of ecstatic devotion and his eyes full of tears, he offered obeisances to the Personality of Godhead and then, with his associates, entered the planet known as Sutala. Thus the Supreme Personality of Godhead satisfied the desire of Aditi and reinstalled Lord Indra. Prahlada Maharaja, being aware of Bali’s release from arrest, then described the transcendental pastimes of the Supreme Personality of Godhead in this material world. Prahlada Maharaja praised the Supreme Lord for creating the material world, for being equal to everyone and for being extremely liberal to the devotees, just like a desire tree. Indeed, Prahlada Maharaja said that the Lord is kind not only to His devotees but also to the demons. In this way he described the unlimited causeless mercy of the Supreme Personality of Godhead. Then, with folded hands, he offered his respectful obeisances unto the Lord, and after circumambulating the Lord he also entered the planet Sutala in accordance with the Lord’s order. The Lord then ordered Sukracarya to describe Bali Maharaja’s faults and discrepancies in executing the sacrificial ceremony. Sukracarya became free from fruitive actions by chanting the holy name of the Lord, and he explained how chanting can diminish all the faults of the conditioned soul. He then completed Bali Maharaja’s sacrificial ceremony. All the great saintly persons accepted Lord Vamanadeva as the benefactor of Lord Indra because He had returned Indra to his heavenly planet. They accepted the Supreme personality of Godhead as the maintainer of all the affairs of the universe. Being very happy, Indra, along with his associates, placed Vamanadeva before him and reentered the heavenly planet in their airplane. Having seen the wonderful activities of Lord Vishnu in the sacrificial arena of Bali Maharaja, all the demigods, saintly persons, Pitas, Bhutas and Siddhas glorified the Lord again and again. The chapter concludes by saying that the most auspicious function of the conditioned soul is to chant and hear about the glorious activities of Lord Vishnu. Sukadeva Gosvami said: When the supreme, ancient, eternal Personality of Godhead had thus spoken to Bali Maharaja, who is universally accepted as a pure devotee of the Lord and therefore a great soul, Bali Maharaja, his eyes filled with tears, his hands folded and his voice faltering in devotional ecstasy, responded as follows. Bali Maharaja said: What a wonderful effect there is in even attempting to offer respectful obeisances to You! I merely endeavored to offer You obeisances, but nonetheless the attempt was as successful as those of pure devotees. The causeless mercy You have shown to me, a fallen demon, was never achieved even by the demigods or the leaders of the various planets. When Vamanadeva appeared before Bali Maharaja, Bali Maharaja immediately wanted to offer Him respectful obeisances, but he was unable to do so because of the presence of Sukracarya and other demoniac associates. The Lord is so merciful, however, that although Bali Maharaja did not actually offer obeisances but only endeavored to do so within his mind, the Supreme Personality of Godhead blessed him with more mercy than even the demigods could ever expect. As confirmed in Bhagavad-gita (2.40), svalpam apy asya dharmasya trayate mahato bhayat: “Even a little advancement on this path can protect one from the most dangerous type of fear.” The Supreme Personality of Godhead is known as bhava-grahi janardana because He takes only the essence of a devotee’s attitude. If a devotee sincerely surrenders, the Lord, as the Supersoul in everyone’s heart, immediately understands this. Thus even though, externally, a devotee may not render full service, if he is internally sincere and serious the Lord welcomes his service nonetheless. Thus the Lord is known as bhava-grahi janardana because He takes the essence of one’s devotional mentality. Sukracarya said: My Lord, You are the enjoyer and lawgiver in all performances of sacrifice, and You are the yajna-purusha, the person to whom all sacrifices are offered. If one has fully satisfied You, where is the chance of discrepancies or faults in his performances of sacrifice? “O best among the twice-born, it is therefore concluded that the highest perfection one can achieve by discharging his prescribed duties according to caste divisions and orders of life is to please the Personality of Godhead.” Everything is meant to satisfy the Supreme Personality of Godhead. Therefore, since Bali Maharaja had satisfied the Lord, he had no faults, and Sukracarya admitted that cursing him was not good. “In this age of quarrel and hypocrisy the only means of deliverance is chanting the holy name of the Lord. There is no other way. There is no other way. There is no other way.” (Brihan-naradiya Purana 38.126) In this age of Kali, it is extremely difficult to perform Vedic ritualistic ceremonies or sacrifices perfectly. Hardly anyone can chant the Vedic mantras with perfect pronunciation or accumulate the paraphernalia for Vedic performances. Therefore the sacrifice recommended in this age is sankirtana, constant chanting of the holy name of the Lord. Yajnaih sankirtana-prayair yajanti hi sumedhasah (Bhag. 11.5.29). Instead of wasting time performing Vedic sacrifices, those who are intelligent, those who possess good brain substance, should take to the chanting of the Lord’s holy name and thus perform sacrifice perfectly. I have seen that many religious leaders are addicted to performing yajnas and spending hundreds and thousands of rupees for imperfect sacrificial performances. This is a lesson for those who unnecessarily execute such imperfect sacrifices. We should take the advice of Sri Caitanya Mahaprabhu (yajnaih sankirtana-prayair yajanti hi sumedhasah). Although Sukracarya was a strict brahmana addicted to ritualistic activities, he also admitted, nischidram anusankirtanam tava: “My Lord, constant chanting of the holy name of Your Lordship makes everything perfect.” In Kali-yuga the Vedic ritualistic ceremonies cannot be performed as perfectly as before. Therefore Srila Jiva Gosvami has recommended that although one should take care to follow all the principles in every kind of spiritual activity, especially in worship of the Deity, there is still a chance of discrepancies, and one should compensate for this by chanting the holy name of the Supreme Personality of Godhead. In our Krishna consciousness movement we therefore give special stress to the chanting of the Hare Krishna mantra in all activities. Lord Brahma, Lord Siva, Lord Karttikeya, the great sage Bhrigu, other saintly persons, the inhabitants of Pitriloka and all other living entities present, including the inhabitants of Siddhaloka and living entities who travel in outer space by airplane, all glorified the uncommon activities of Lord Vamanadeva. O King, while chanting about and glorifying the Lord, they returned to their respective heavenly planets. They also praised the position of Aditi. O Maharaja Parikshit, pleasure of your dynasty, I have now described to you everything about the wonderful activities of the Supreme Personality of Godhead Vamanadeva. Those who hear about this are certainly freed from all the results of sinful activities. One who is subject to death cannot measure the glories of the Supreme Personality of Godhead, Trivikrama, Lord Vishnu, any more than he can count the number of atoms on the entire planet earth. No one, whether born already or destined to take birth, is able to do this. This has been sung by the great sage Vasishtha. Vasishtha Muni has given a mantra about Lord Vishnu: na te vishnor jayamano na jato mahimnah param anantam apa. No one can estimate the extent of the uncommonly glorious activities of Lord Vishnu. Unfortunately, there are so-called scientists who are subject to death at every moment but are trying to understand by speculation the wonderful creation of the cosmos. This is a foolish attempt. Long, long ago, Vasishtha Muni said that no one in the past could measure the glories of the Lord and that no one can do so in the future. One must simply be satisfied with seeing the glorious activities of the Supreme Lord’s creation. The Lord therefore says in Bhagavad-gita (10.42), vishtabhyaham idam kritsnam ekamsena sthito jagat: “With a single fragment of Myself, I pervade and support this entire universe.” The material world consists of innumerable universes, each one full of innumerable planets, which are all considered to be products of the Supreme Personality of Godhead’s material energy. Yet this is only one fourth of God’s creation. The other three fourths of creation constitute the spiritual world. Among the innumerable planets in only one universe, the so-called scientists cannot understand even the moon and Mars, but they try to defy the creation of the Supreme Lord and His uncommon energy. Such men have been described as crazy. Nunam pramattah kurute vikarma (Bhag. 5.5.4). Such crazy men unnecessarily waste time, energy and money in attempting to defy the glorious activities of Urukrama, the Supreme Personality of Godhead. 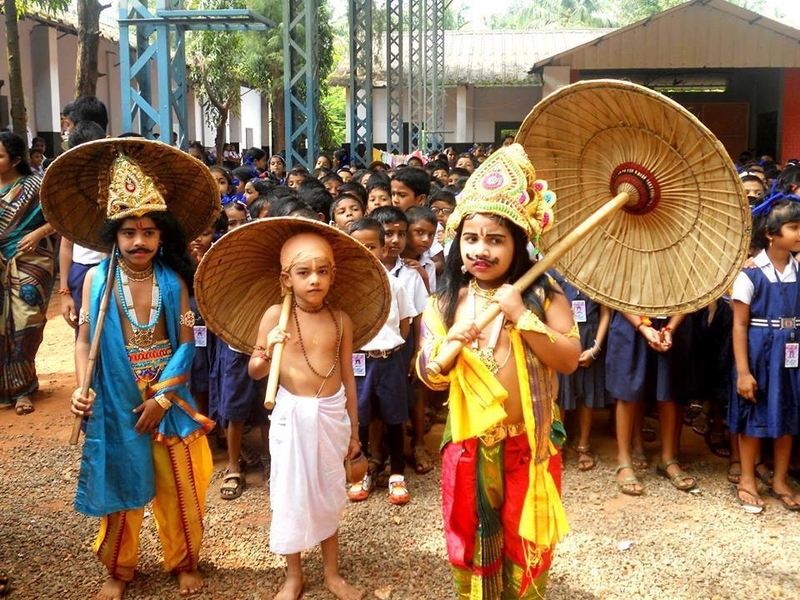 Whenever the activities of Vamanadeva are described in the course of a ritualistic ceremony, whether the ceremony be performed to please the demigods, to please one’s forefathers in Pitriloka, or to celebrate a social event like a marriage, that ceremony should be understood to be extremely auspicious. There are three kinds of ceremonies—specifically, ceremonies to please the Supreme Personality of Godhead or the demigods, those performed for social celebrations like marriages and birthdays, and those meant to please the forefathers, like the sraddha ceremony. In all these ceremonies, large amounts of money are spent for various activities, but here it is suggested that if along with this there is recitation of the wonderful activities of Vamanadeva, certainly the ceremony will be carried out successfully and will be free of all discrepancies.